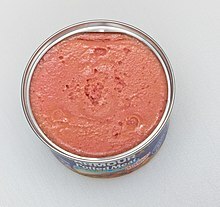 A potted meat food product is a food preserved by canning and consisting of various seasoned cooked meats, often puréed, minced, or ground, which is heat processed and sealed into small cans. This is different from potted meat, an older noncommercial method of preserving meat. Various meats, such as beef, pork, chicken, turkey and organ meats are used. It is produced primarily as a source of affordable meat. Its precooked state and long shelf life make it suitable for emergency food supplies, camping and military uses. Potted meat food product contains high amounts of fat, salt and/or preservatives which may make it unhealthy for regular consumption. It typically has a spreadable consistency, and is usually used for sandwiches or spread on crackers. Canned meats have a mixed reputation for their taste, texture, ingredients, preparation and nutrition. The canning process produces a product with a generally homogeneous texture and flavor. The low-cost ingredients used also affect the quality. For example, mechanically separated chicken or turkey is a paste-like product made by forcing crushed bone and tissue through a sieve to separate bone from tissue. In the United States, mechanically separated poultry has been used in poultry products since 1969, after the National Academy of Sciences found it safe for use. On November 3, 1995, the Food Safety and Inspection Service of the U.S. Department of Agriculture published a final rule in the Federal Register (see 60 FR 55962) on mechanically separated poultry, stating that it was safe to use without restrictions. However, it must be labeled as "mechanically separated" chicken or turkey in the ingredient statement. The final rule became effective on November 4, 1996. Armour Star: Mechanically separated chicken, beef tripe, water, salt, and less than 2%: mustard, natural flavor, garlic powder, vinegar, dextrose, sodium erythorbate, and sodium nitrite. Hormel: Beef tripe, mechanically separated chicken, beef hearts, partially defatted cooked beef fatty tissue, meat broth, vinegar, garlic powder, onion powder, salt, flavoring, sugar, and sodium nitrite. Libby's: Mechanically separated chicken, pork skin, partially defatted cooked pork fatty tissue, partially defatted cooked beef fatty tissue, vinegar, less than 2% of: salt, spices, sugar, flavorings, sodium erythorbate and sodium nitrite. ^ "9 CFR Part 318, et al. ; Poultry Products Produced by Mechanical Separation and Products In Which Such Poultry Products Are Used; Final Rule" (PDF). U.S. Department of Agriculture. Retrieved 2007-11-25. This page was last edited on 6 April 2019, at 03:56 (UTC).